Well this is a surprise. 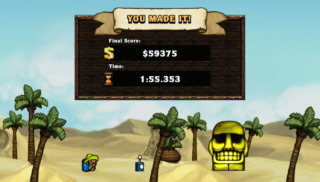 Not just the fact that someone has set a new Spelunky any% speedrunning record with a time of under 2 minutes, but also that you can use the game's Teleporter without immediately becoming fatally embedded inside of a wall. Both of these feats were performed by "Pibonacci" , and have now been uploaded for all to see. Just make sure you've turned your speakers down... he becomes understandably, er, animated towards the end of the run.